Do you ever run across something and just know it would be the perfect gift for someone that you love and just know in your heart of hearts that they will absolutely love it? That's how I felt when I saw this Catallica Pet Em All Tank Top. I knew it would be perfect for my youngest daughter. My youngest daughter is a heavy metal/crazy cat woman kind of girl. I couldn't help but laugh when I saw this shirt, knowing how perfect it is for her. I was so right!! She loves it! !As a matter of fact her exact words were "I love it!! This is my new favorite shirt!!" That made my day to say the least. I really enjoy finding a gift that's really appreciated and liked. When I ordered it, I ordered a size Medium for her. The sizes are true to size. It fit her perfectly. It's 100 % cotton, so it's very comfortable. It comes in either black or white. 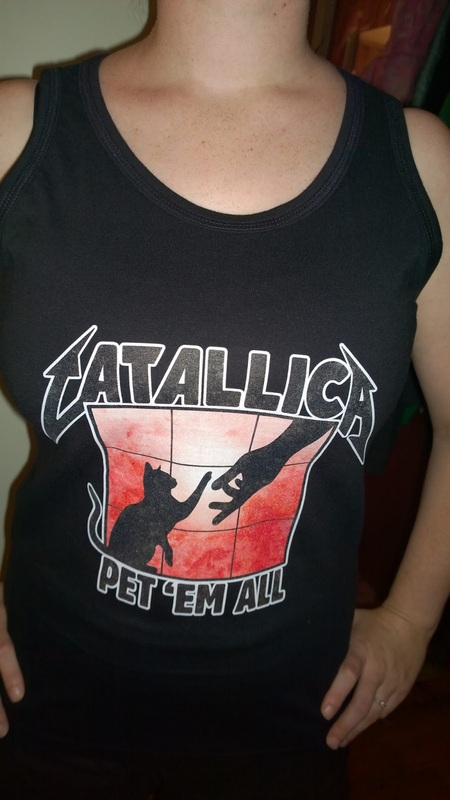 This tank top would make a great gift for any occasion for the heavy metal/ crazy cat lady in your life, birthday, anniversary, graduation, or just because. I really like that it's funny, but is completely acceptable to wear just about anywhere. No one can be offended, that's a big plus these days, it's funny and politically correct.